Mom and Dad are so surprised to be sitting here one year later already. She has grown so much. Even though her party was this past Saturday, we still had to post today, of course. You have seen the pictures, so now the video. You see all the nail biting suspense of her cake episode. 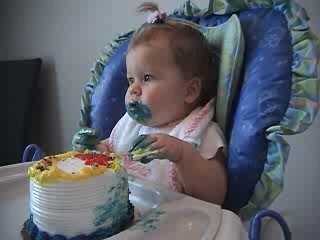 She ate cake… She didn’t eat cake… you decide! You see her open presents. Forget the clothes! I want the bath fizzies! And MORE….